Public transport makes all the difference. Aside from easy access to urban spaces, public transport reduces air pollution and road traffic. For tourists, it’s a great way to explore a city – you can sit back and take in the sights without trying to navigate a car in a foreign country. 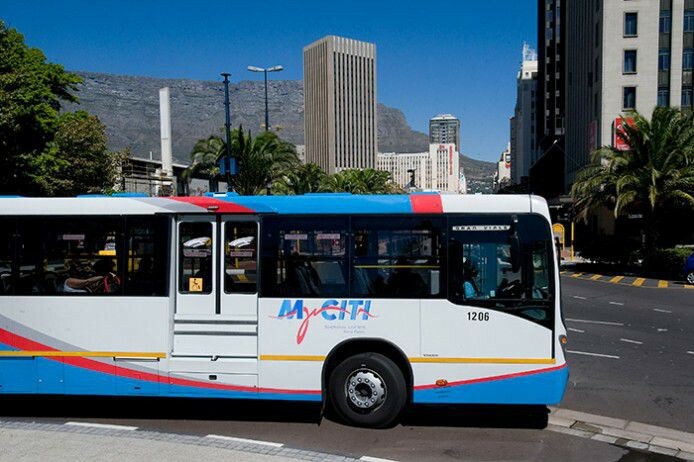 The MyCiTi bus system in Cape Town is one of the most convenient ways to get around. MyCiTi is a cash-free system: you need a myconnect card to use the bus, and you’ll need to ‘top it up’ with credit. You can do so at MyCiTi stations or certain retailers. The closest retailers to Parker Cottage are the PostNet post office and the Spar grocery store, both on Kloof Street. Don’t forget your card’s pin code, which you’ll need for future top-ups. Your fares depend on how far you’re travelling. If you’ll only be using it for a few days to travel around the city centre, you should be fine with about R50 – R100 credit. Once you have your card, you can get on and off at any stop. If you’re getting on or off the bus at a regular stop (in other words, not a station) you’ll ‘tap in’ and ‘tap out’ with the validator on the bus itself. Be careful to tap the correct screen: there’s one for entering and another for exiting. You may pay a penalty fine if you tap the wrong screen. Just ask for help if you’re confused – South Africans are friendly and willing to assist! If you’re using the bus from one of their stations, you’ll tap in and out at the station gates, so no need to do it again once you’re on the bus. You’ll need one card per traveller, but children under 4 ride for free. One of MyCiTi’s best features is its interactive map. Simply plug in which stops you need and when, and it’ll tell you bus times and how long your commute will take. You can also use Google Maps’ transit feature to the same effect. If you’re unsure of which stops you’ll need, drop us an email or check out our favourite routes below. The closest stops to Parker Cottage are the Belle Ombre stop on Kloof Nek Road, and the Ludwig’s Garden stop on the Kloof Nek dogleg. Depending on which direction you’re going, these are the starting and ending stops you’ll need. You can take the 107 bus from Belle Ombre up to Table Mountain. Jump off at the Kloof Nek stop and walk over to the Cable Car stop on Tafelberg Road. It’ll take you right up to the cable way; from there you can walk 1.5 km to the trailhead for Platteklip Gorge if you’re hiking. You can take the same route (107) to Camps Bay. Exit the bus at the Camps Bay stop and enjoy a stroll along the promenade on Victoria Road. You can get back on the 107 at the Whale Rock stop (at the end of Victoria Road) which will take you back towards Parker Cottage. From Whale Rock, you can also catch the 108 all the way to Hout Bay. You’ll want the Atlantic Skipper stop if you’re going to the Bay Harbour Market . From Parker to market will take almost an hour, so be prepared to enjoy the ride. If you’re using the bus to get into town, take the 107 from Ludwig’s Garden. Jump off at either the Upper Loop or Groote Kerk stops, depending on where you want to go. If you continue on this line, you can get to the Civic Centre bus station; from here you can connect to numerous routes, including the T01 which goes through Milnerton and Blouberg, or the 102 to Salt River Circle. Once you know where you want to go, use the MyCiTi fare calculator to estimate how much credit you’ll load onto your card. The city really is at your fingertips with MyCiTi. Contact us for more information about getting around with the bus.